Methane oxidation by methanotrophs is a very important environmental process in the mitigation of methane. Methylobacter (Mtb.) clade 2 members have been reported as dominant methane oxidisers in soils and sediments worldwide. We enriched and purified a methanotroph from a tropical rice field soil sample from India. The highly enriched culture showed the presence of motile, long and thick rods (3–5 µm × 0.9–1.2 µm) and minor presence of short, thin rods. The culture was purified on agarose medium and formed yellow colonies which showed the presence of only thick and long rods, henceforth termed as strain KRF1. Based on 16S rRNA gene sequence analysis, strain KRF1 shows close phylogenetic affiliation to Methylobacter tundripaludum SV96T (98.6% similarity). Due to the taxonomic novelty, and being the first member of Mtb. related to Mtb. tundripaludum from the tropics, the draft genome was sequenced. From the blastx analysis of the contigs, it was clear that the culture still had contamination of another organism, a Methylophilus species. The data binned in two clear bins: Mtb. related contigs and Methylophilus-related contigs. The binned draft genome of KRF1 shows features including the typical pathways for methane metabolism, denitrification and the presence of molybdenum iron and vanadium-iron nitrogenase genes. KRF1 is phylogenetically distinct from the five strains of Mtb. tundripaludum including SV96T, Lake Washington strains and OWC strains, showing ~ 26% DDH and ~ 81% ANIb values and a unique position in a phylogenomic tree. Subsequently, KRF1 has been completely purified from its methylotrophic partner and a pure culture has been established and maintained in a WDCM approved culture collection, the MACS Collection of Microorganisms (as MCM 1471). 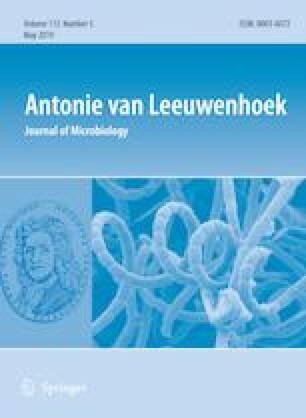 KRF1 is thus the first cultured member of a putative novel species of Methylobacter clade 2 isolated from the tropics. The online version of this article ( https://doi.org/10.1007/s10482-019-01262-y) contains supplementary material, which is available to authorized users. Kumal Khatri and Pranitha S. Pandit have contributed equally to this work. MCR and PKD acknowledge SERB, Department of Science and Technology for providing funds (EMR/2017/002817). PSP acknowledges Department of Science and Technology for providing her women scientist (WOS-A) fellowship and funds (SR/WOS-A/LS-410/2017). Kumal Khatri acknowledges CSIR for the research fellowship. We would like to thank research student, Ms. Jyoti A. Mohite for her help during cultivation experiments. We thank the rice farmer for allowing us to sample from his field. MCR and PKD designed the study. MCR wrote the manuscript, did the phylogenetic analysis and prepared most of the Figures. PSP and KK cultivated the organisms and performed all culture based studies, DNA extraction and sample preparation for sequencing. All the authors edited the manuscript and approved the final version.